Temple of the Golden Buddha or Wat Traimit houses a solid gold Buddha image. At one point, towards the end of the 18th century, the statue was covered with stucco and moved in order to hide it from the invading Burmese. Later the temple that housed the statue was closed down, and the statue was moved to Wat Traimit in Chinatown in Bangkok. The abbot of the temple tried to get the statue transmitted, but because of it’s large size and plain looks nobody wanted it. As they moved the statue, it got caught in the rain and dropped, causing the stucco to break away and the solid gold statue underneath to be revealed. 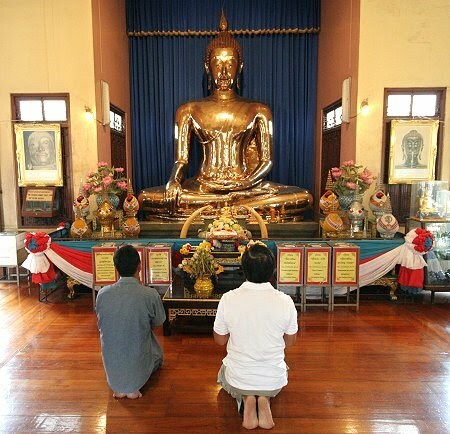 Needless to say, the statue still resides at Wat Traimit. Distance from knee to knee of the lap: over 9 ft. Distance from base to top: Over 11 ft. Weight of hair and topknot: 99 lbs. Conclusion: More than my weight in gold by quite a stretch. Getting a craving for some Thai food? Check out this awesome recipe for Thai Green Curry Fish HERE on Fat Chick Sings! This entry was posted in Uncategorized on June 27, 2010 by fatchicksings.